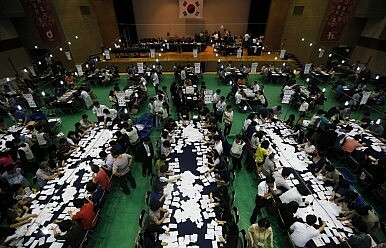 The ruling Saenuri party took 11 seats in the by-election, giving it a strong majority in the legislature. In the weeks leading up to the National Assembly by-election on July 30, the outcome of this so-called “mini-national election” seemed unforeseeable. The opposition New Politics Alliance for Democracy (NPAD) became embroiled in internal strife, diminishing the public’s confidence in the progressive party’s ability to govern. Meanwhile, President Park Geun-hye’s approval ratings took a hit due to her controversial cabinet nominations, also throwing the ruling Saenuri Party’s electoral prospects into doubt. This author, in particular, had believed that the conservatives faced immense difficulties entering the by-election. The Saenuri Party only needed 4 more seats to establish a majority in South Korea’s unicameral legislature and the party leadership predicted that it would win 8 or 9 seats out of the 15 being contested. This proved to be a modest projection as the final tally revealed that the conservatives had trounced the opposition by winning 11 seats, including one in the NPAD home turf of South Jeolla Province. With 158 seats ensuring a comfortable majority in the National Assembly, the conservative party’s success has several immediate ramifications. First, it consolidated the leadership of Kim Moo-sung, who only became party chairman at the national party convention on July 14. Kim ran on the platform that he would maintain a “healthy tension” with the executive branch and underscored the importance of voicing the party’s opposition to the president when needed. This position attracted criticism from his “pro-Park” rival, Suh Chung-won, who argued that division between the Blue House and the president’s party ran the risk of electoral defeat. By firmly securing the party’s control over the legislature, Kim has not only dispelled doubts over the direction he is taking the party, but also paved the way for long-term party unity. Second, the ruling party’s victory bolstered President Park’s political capital in economic policymaking. In particular, Seoul is looking to open its domestic rice market to foreign competition and conclude negotiations with China over a bilateral free trade agreement. Since the Saenuri Party’s comfortable majority in the National Assembly will ease the ratification of any treaties resulting from these negotiations, the Blue House has more room to maneuver at the negotiating table. The crushing blow also has immense consequences for the opposition. South Korean newspaper Joongang Ilbo highlighted the NPAD’s excessive politicization of the Sewol ferry disaster and the public’s perception that the opposition was needlessly paralyzing Seoul’s ability to govern as some of the key reasons behind its defeat. Indeed, while the Saenuri Party campaigned on the promise of economic revitalization, the NPAD’s message appeared to be largely limited to holding the current administration responsible for the Sewol ferry disaster. In addition, many pointed out that infighting over the party’s candidate selections in key constituencies played a detrimental role in the progressive’s election campaign. With the landslide defeat confirming the opposition’s inability to win back public support in its current posture, chairmen Ahn Cheol-soo and Kim Han-gil have resigned, paving the way for an imminent leadership contest in the NPAD. Given these weaknesses, the NPAD appears unlikely to mobilize any significant opposition to the ruling Saenuri Party in the near future. At the same time, the Blue House has had its public mandate renewed, quelling concerns that Park Geun-hye had already become a lame-duck president due to plummeting public support. Now, the public’s attention will focus on whether the Saenuri Party can utilize this second opportunity to govern more effectively than it had before.